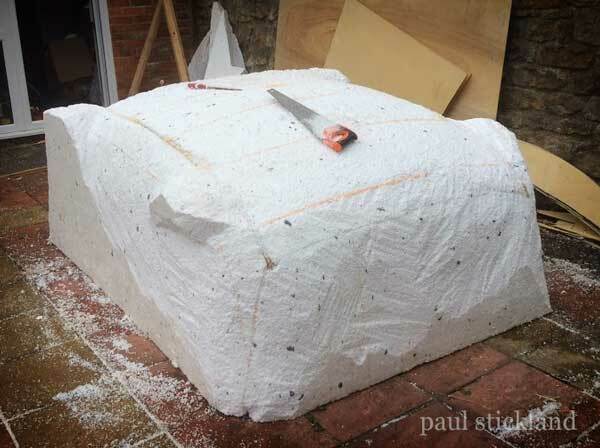 Paul Stickland Blog: How to Build a Dinosaur! Paul Stickland Art and Design, Illustration, Children's Pop up and Picture Books. Dinosaur Roar! News. Author Events and Pop Up Workshops. How to Build a Dinosaur! 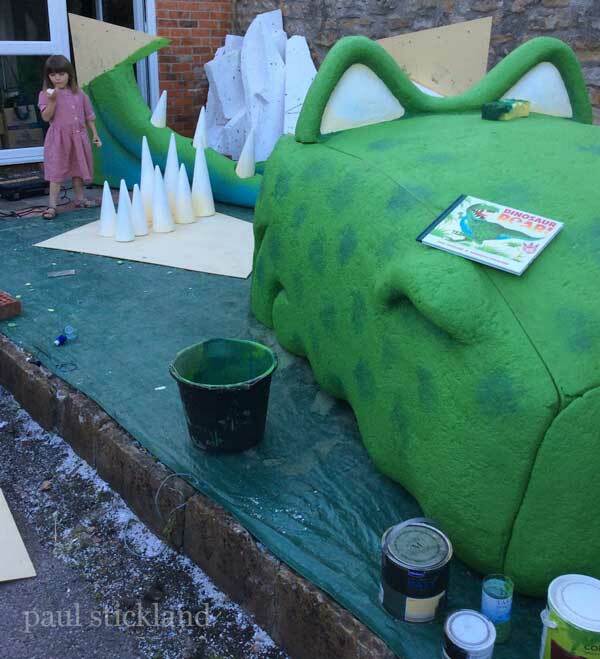 When the amazing team at Seven Stories asked me to build a giant Dinosaur Roar! for their Creation Station, how could I say no?! I was delighted to be invited to be Artist in Residence at The National Centre for Children's Books, Seven Stories in Newcastle in July 2014. Seven Stories is the most amazing place to visit if you, like me, love children's books. Everything in the building is designed to foster a love for children's books and children's literature. Wonderful exhibitions featuring the world's best children's book illustrators and authors work, the most incredible children's bookshop and a busy program of events to delight the lucky children that live within reach. What a resource, the children of the Noth East are very lucky indeed. Seven Stories' dedicated, friendly and resourceful staff really pulled out the stops to celebrate the 20th Anniversary of Dinosaur Roar! I was really honoured. So when Lorna Duncanson emailed me suggesting that I build a giant dinosaur during my time there, I leapt at the chance! At first I thought I would build the whole of Dinosaur Roar but that was fraught with problems. I would have to build a strong armature or skeleton to support his body and if I was to create him in his typical roaring poses, getting him to balance would be a fine art. 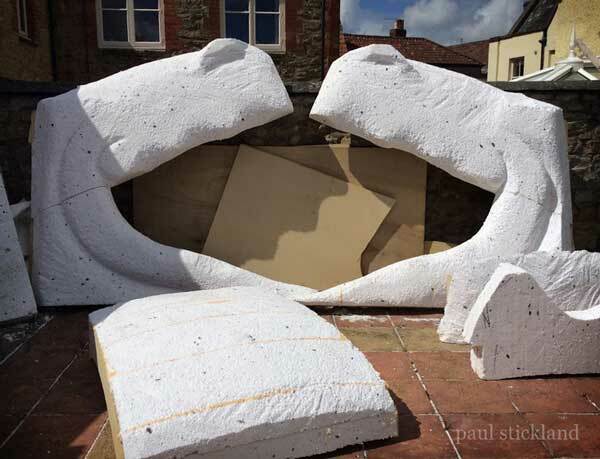 Sitting in the June sunshine in the lush jungly backyard of our Dorset townhouse, I suddenly struck on the idea of just creating his head and better still creating it so that the children could climb into his mouth and sit on his tongue! Perfect, I knew that they would love that, I would have done when I was little! 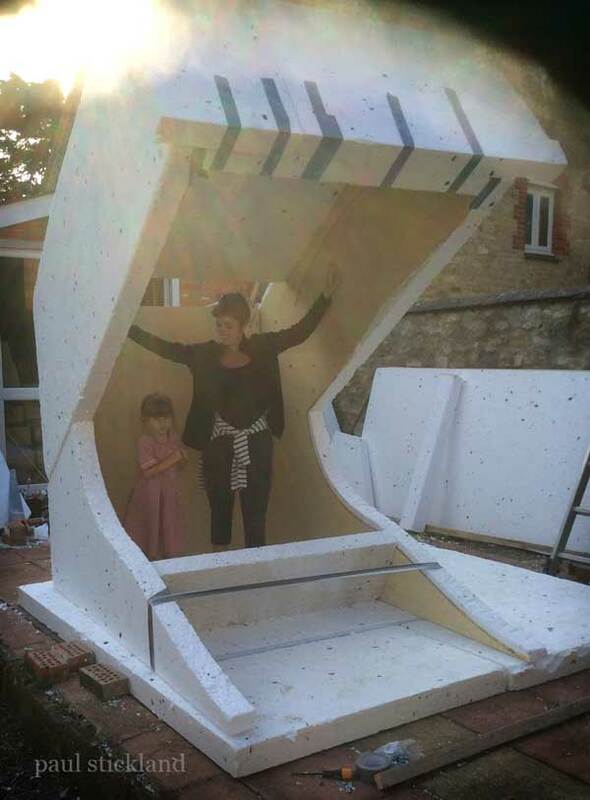 Now, how to build a giant dinosaur's head? Dinosaur Roar's head is a fairly simple rectilinear shape, a boxy top jaw and a simialr slab-sided lower jaw, so I began to think of how I could construct him. Importantly, I was going to be constructing him in the garden of our good friend, Wayne Winstone's brilliant bookshop, Winstone's in Sherborne and he would then be dissembled and put into a van for the 350 mile journey from Dorset to Newcastle. So he had to be built in sections and this turned out to be an absolute godsend. Lorna sent me photographs and dimensions for the Creation Station and I was ready and raring to go. I had roughly 10 days and that included a Routes to Reading event in Bristol and some semblance of normal family life! 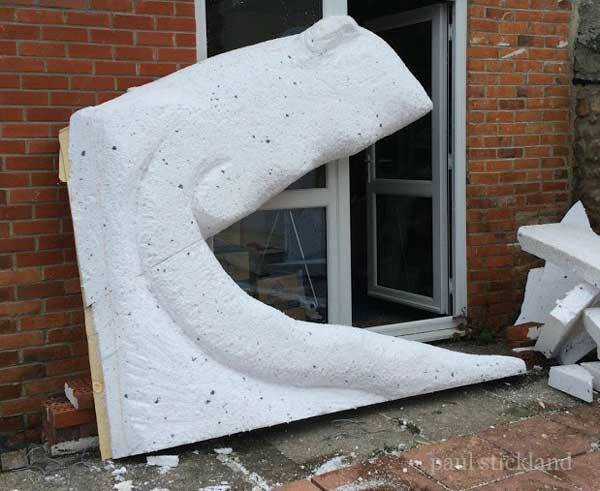 I knew that I wanted to sculpt the dinosaur out of EPS polystyrene foam. He was to be so big that I had to use a lightweight material. I could'nt easily source the 200mm foam sheets that I would have preferred so I decided to laminate two 100mm sheets and then to laminate these onto 5.5mm marine plyboard. I would have preferred to use 9mm but 5.5mm actually turned out to be fine for the task and much easier to handle. After an exhaustive web search I found the cheapest local sources of materials and delivered them to Winstone's ready to start the construction. The last week in June was hot and this sunny little stone walled yard in Sherborne was really hot! I'm an experienced builder ( 3 houses to date ) and have a very good sense of 3D, so having designed this entirely in my head, I set about roughing out the sections. Creating Dinosaur Roar in the first place obviously helped, I always think of my character creations in 3D, that's just the way my head works. I had also been doing a lot of work behind the scenes recreating the dinosaurs from Dinosaur Roar in 3D software, so I had a clear 3D picture in my head already. I decided to break him down to his rectilinear elements, each to be created from one 2.4 x 1.2metre sheet of material, which I knew would fit into the VW T5 LWB van that I was going to hire for the drive north. Thus we had a top jaw created out of two sides, a front nose, the top of his jaw and an eye section. The lower jaw was just the two sides as this would dissappear into the floor whils acting as support. I sketched out the rough shapes, transferred these to the ply and cut them to shape with a jigsaw. 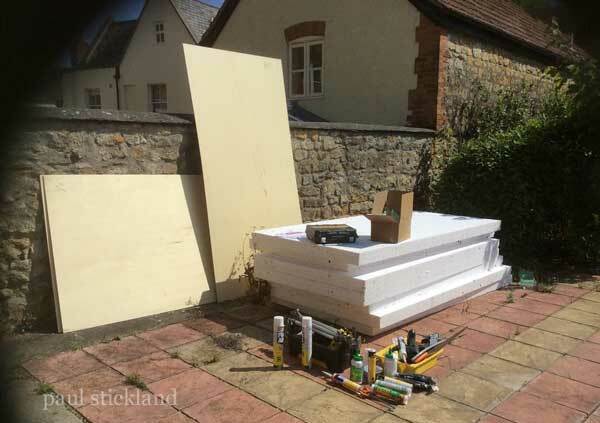 I then laminated the foam and ply together using a foaming glue intended for EPS foam. Amazing stuff, I used a lot! Once I had all the sections cut out I decided to do a rough assembly to check dimensions and just how strong the structure would be. I did not want the good children of Newcastle to have an unpleasant dinosaur-based accident! Clamped together here, note ever present gaffer tape! Looking just a little tall! I then built the top of his top jaw and a nose section, ready to assemble on the next day. 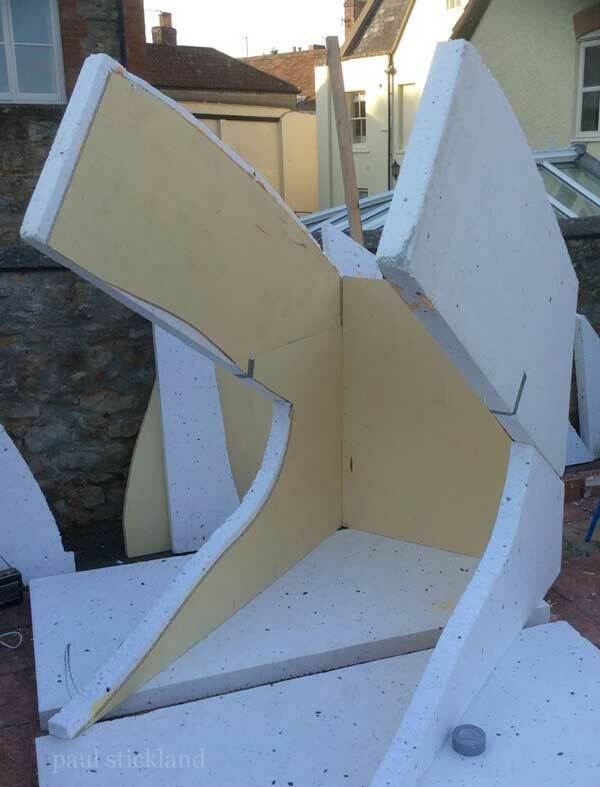 Some great progress in the garden of Winstone's bookshop, with the whole structure bolted together for easy dismantling, rather than clamps and gaffer! His top jaw was nearly complete. I had to take his top jaw off overnight in case of gales and storms ( it is Glastonbury after all) and it'll be so much easier to sculpt the jaws separately. I ordered his 16 teeth today from CraftMill. They are florists/craft polystyrene cones and the suppliers were very amused by the use I was going to put them to. Free express shipping against a picture for their website, brilliant! Tonight see some more research into the ultimate affordable hard coating for the foam before painting. All ideas welcome! I'm looking at using a PVA/latex caulk/dry wall jointing compound mix. Sounds like a mixer, bucket and brush killer to me but I would like to make it fairly child proof! After a night of worring about his nose height, I had to start the day by closing his jaws slightly to loose height. Annoying, as it spoilt the simplicity of my bolting system but it did allow me to strengthen the joint between upper and lower jaws. It also enhanced the theatricality of sitting in a dinosaur's mouth. His mouth was just open too wide and you couldn't see his wicked eyes either! 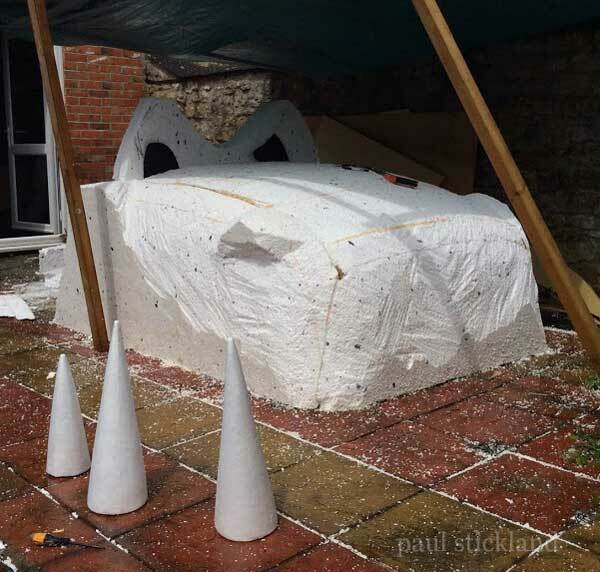 So, as the clouds gathered, I managed to add another 100mm of foam all round and as soon as the storm passed and the had glue set, I started to sculpt. It may be just foam but wow, hard work...and the noise of screeching polystyrene, my ears were ringing. I used a simple hand saw and occasional kitchen knife. I know I was sculpting a dinosaur's top jaw, it actually felt like I was working on a 1960's Triumph TR3, MGA or an early Porsche. Being able to quickly bolt all the sections together quickly was really helpful. I made a massive mess, took hours to round up all those granules! His teeth arrived and were perfect! Thanks CraftMill! Laminated up his eyes ready for the morning before retiring, exhausted! Very challenging weather! Wind and torrential rain.. Eyes in place, time to work on the lower jaw. Bolting the top and bottom jaws allowed me to sculpt his all important smile. Trying to get the relationship between the eyes and the smile is key to getting him to come alive and to look naughty but friendly and not scary. It's easy to scare kids and I'm not interested in that. All the parts ready for the final sculpting, fuelled by the most excellent Winstone's coffee. Time for a day off in Bristol giving Dinosaur Roar talks at Little Reader's Day Out for Routes to Reading. A huge amount of activity with great help from Helen and Tabitha. We finish the sculpt and prime the foam with waterproof PVA before coating it with my mystery magical foam coat mix! Wilkinsons come up trumps with a great green, named Elf, perfect! A few darker green blotches and white for his eyes. I coated his teeth with a flexible crack filling paint, which worked a treat, heavily applied! A touch of yellow on his teeth and eyes to make the colours really glow. Down to the wonderful Hansons in Sturminster Newton. They have an amazing collection of fabrics and sure enough I found this fabulous two way stretch fabric for the inside of his mouth, shiny and bright red it's perfect. The lady at Hansons was full of really helpful advice on how to prepare this for installation and by midnight that night I had hemmed Wundawebbed and bound all the edges ready to install in Newcastle. We are nearly done, time to put him all together! It all fits and looks fabulous. He's attracting a lot of attention at the bookshop and even gets the seal of approval from Valerie Singleton. Result! 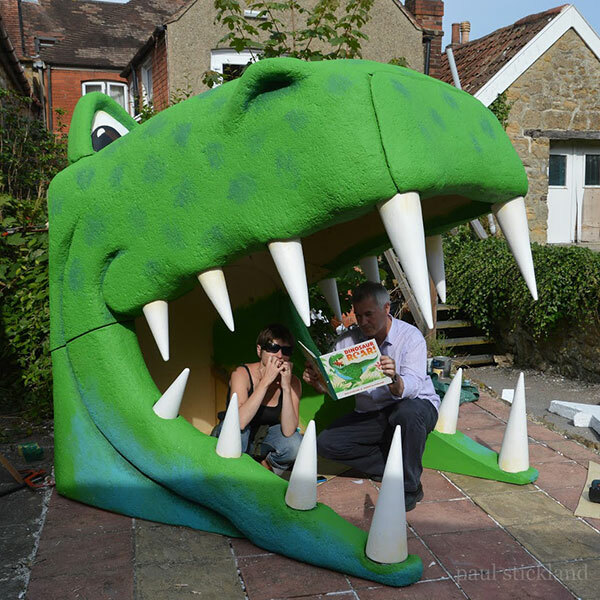 Here he is about to devour both Helen and Wayne Winstone, hardly fair after having let me use his bookshop garden to make such a dreadful mess a giant dinosaur! 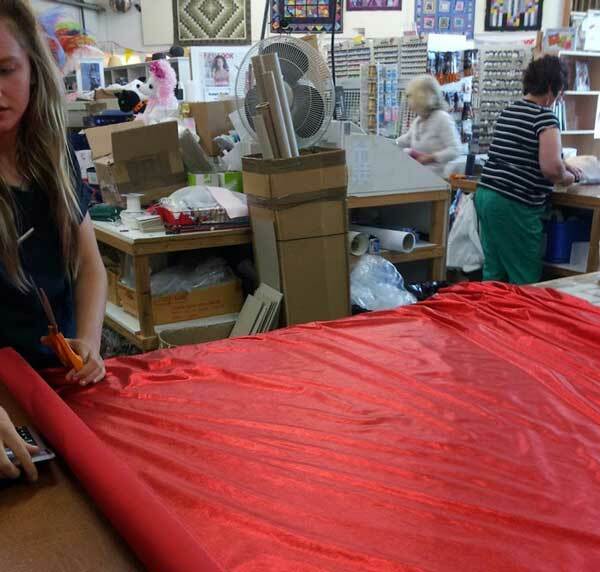 I have built a big red soft foam tongue for the children to sit on, sourced a lurid red carpet for his tongue and then, with about 5 minutes to spare, it's time to take him to pieces and load him into the van, will he fit? 350 miles later and we arrive at Seven Stories in Newcastle and take him down to his new home in The Creation Station, ready to assemble! I spend Friday at two lovely schools in Houghton le Spring and Whitley Bay, opening their great new library and meeting about 600 kids. Next day with the fabulous help of our good friend Dean Marriner we put him together. He fits! Phew! Children and their parents are beginning to filter into the building for all manner of Dinosaur Roar fun. Helen's making the dinosaur masks that I designed, whilst Dean, Tabitha and I fit his teeth. Then we let the children loose on him! Let the ROARING (and tooth wiggling) begin! Hi, I'm Paul Stickland and this blog records some of my current art works. It charts the exciting development of Dinosaur Roar into a new multi media world. 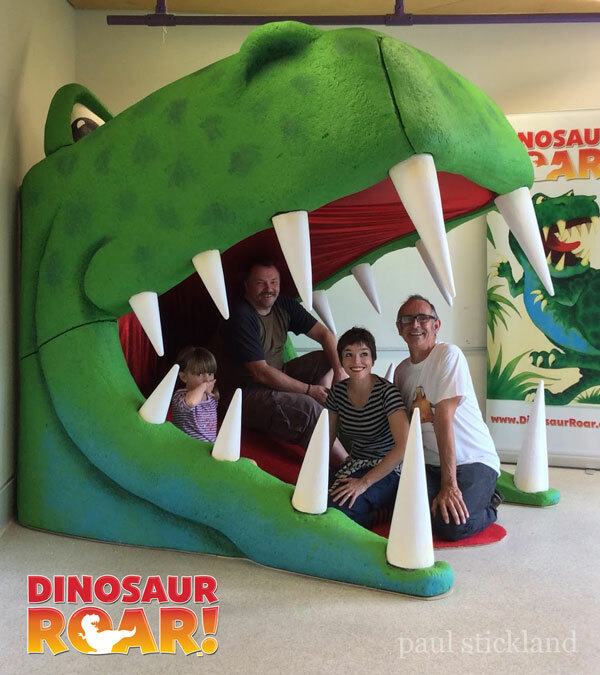 Now beautifully published by Macmillan Children's Books in collaboration with The Natural History Museum in London, Dinosaur Roar is being reborn for a new generation of dinosaur mad kids! 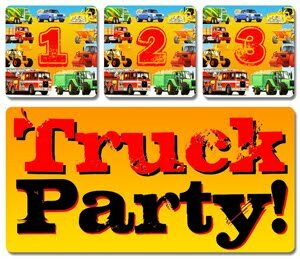 Kid's Truck Theme Birthday Parties! 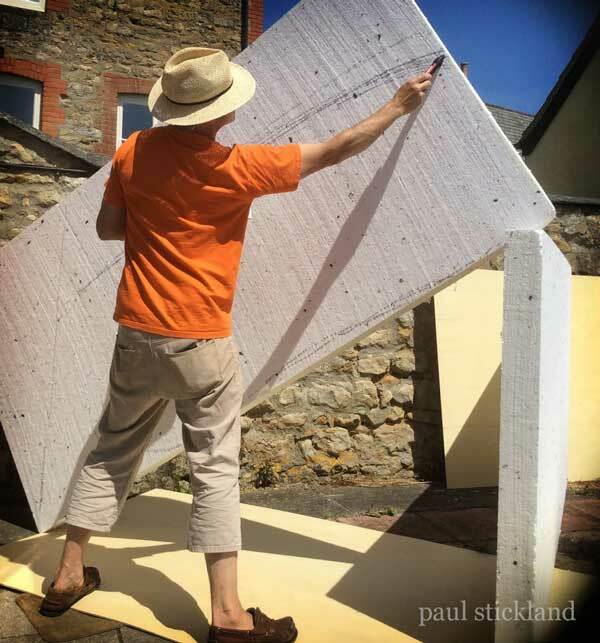 Visit Paul Stickland's profile on Pinterest. by paul stickland ©paul stickland. Simple theme. Powered by Blogger.